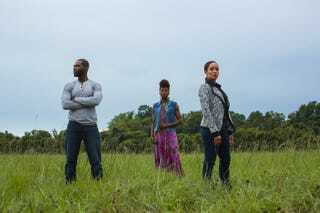 Ava DuVernay's Queen Sugar has yet to premiere on OWN, but it already has network executives gearing up for a second season. The first season of the Oprah Winfrey-produced series starts Sept. 6, and according to Deadline, the second season will start sometime in 2017. Queen Sugar is based on the book of the same name by Natalie Baszile and stars Rutina Wesley and Dawn-Lyen Gardner as estranged sisters who inherit their father's sugarcane land. Nova (Wesley) is a journalist and activist, and Charley (Gardner) is the wife and manager of an NBA star. Kofi Siriboe also co-stars as Ralph Angel, a young father who's a former convict.